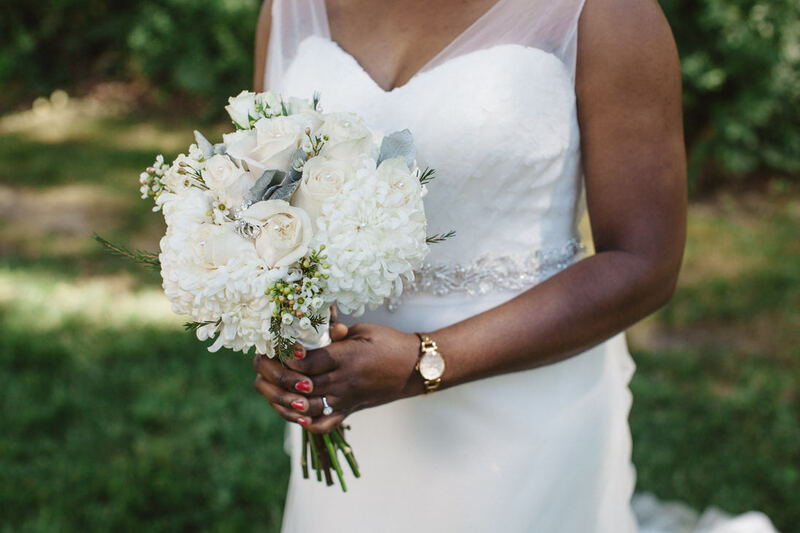 Dionne and Asaph had an intimate, Harding Waterfront Estate wedding on Canada Day. Interesting story… we’d never heard of this venue (then called Holcim Waterfront Estate, before the official name change) until this lovely couple contacted us about shooting their wedding. You’d think we would’ve known about it, since it’s located in Mississauga, but we honestly had no clue! When we looked up photos on Google, we were shocked that such a beautiful wedding venue existed in our own city! Sometimes being ignorant brings such pleasant surprises, hahaha! You can’t tell from these photos, but it rained cats and dogs the morning of Dionne & Asaph’s wedding! The downpour didn’t last very long, but it hit right when we were preparing to head out for the day. As we were driving to the Estate, it was raining so heavily, we almost had to pull over because visibility was so low! At that point, we pretty much expected that we’d have shoot inside the building and under a tent for the entire day! But as you can see in these photos, the skies changed dramatically. By the time Dionne & Asaph finished getting ready, the rain had stopped completely! Lesson be learned for all you Brides out there who obsessively check the weather on your wedding day… try not to worry too much! After years of shooting weddings, we’ve learned that the weatherman is often wrong! Dionne & Asaph planned to have their ceremony facing the waterfront at the back of the mansion, but that was not possible because the grass was so saturated from the rain. Luckily, Harding’s management team reacted quickly and suggested that they have the ceremony at the front of the mansion instead. By the time the wedding ceremony started, the skies were blue and the sun was shining brightly! If that’s not a blessing upon Dionne & Asaph’s wedding, I don’t know what is!